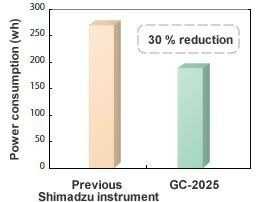 Shimadzu’s new-generation GC-2025 capillary gas chromatograph minimizes environmental impact by reducing power and carrier gas consumption while retaining the performance capabilities required for capillary analysis. The GC-2025 incorporates a digital flow controller that controls both the carrier and detector gases and a newly designed energy-saving column oven that features small volume and less heating loss, realizing a dramatic improvement in operation costs. 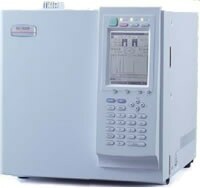 The compact GC-2025 is the gas chromatograph for environmentally friendly, high value performance. The eco-friendly GC-2025 significantly cuts electric power costs compared to previous models to reduce the burden on the environment. Heat losses are significantly reduced through high-performance insulation and a smaller oven size to reduce the heating requirements. In addition, it incorporates an energy-saving heater to further cut power costs. Power consumption is reduced by 30% for programmed temperature analysis in comparison to other GC models. In recent years, there has been an increasing demand for instruments with a smaller installation footprint to more effectively utilize laboratory space. 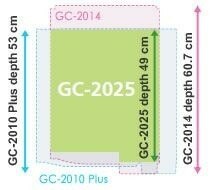 The GC-2025 meets this requirement while incorporating all the functions required for normal capillary analysis. The split/splitless injection unit (SPL), flame ionization detector (FID), and electronic flow controllers (AFC/APC) are installed as standard. Compact Design Accepts Commercial Capillary Columns Despite the compact instrument design, the small-capacity oven accommodates the shape of commercially available capillary columns (column depth 9 cm max.). Incorporating design elements from the high-performance GC-2010 Plus capillary gas chromatograph, the GC-2025 achieves energy savings while offering the highest performance demanded for capillary analysis, delivering highly accurate analysis results and enhanced productivity. The FID minimum detectable limit of 2 pgC/s offers high sensitivity for trace analysis. The GC-2025 adopts the same well-proven electronic flow controllers (AFC/APC) for carrier gas and detector gas control that are used in the GC-2010 Plus. They offer highly accurate flow control to achieve excellent reproducibility.